The International Monetary Fund has moved to restore calm on financial markets after two days of turmoil. The IMF said the current crisis was "manageable", despite continuing falls in share prices around the world. Over the past two days central banks in several countries pumped billions of dollars into banking systems in an effort to keep money flowing. The markets have been driven down by fears that US mortgage market problems could prompt a worldwide credit crunch. Billions of dollars, pounds and euros have been wiped off share values, hitting businesses and individual investors. On Friday, New York's main Dow Jones share index ended 31.14 points - or 0.2% - lower at 13,239.59. 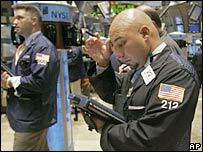 Earlier, the French, German and Asian indexes had also closed significantly lower. In a statement issued late on Friday, the IMF said: "We continue to believe that the systemic consequences of the reassessment of credit risk that is taking place will be manageable. "The fundamentals supporting strong global growth remain in place."